MAKING the most of his wildcard entry, Omar Jasika excelled on his home court to advance to the second round of the Australian Open. 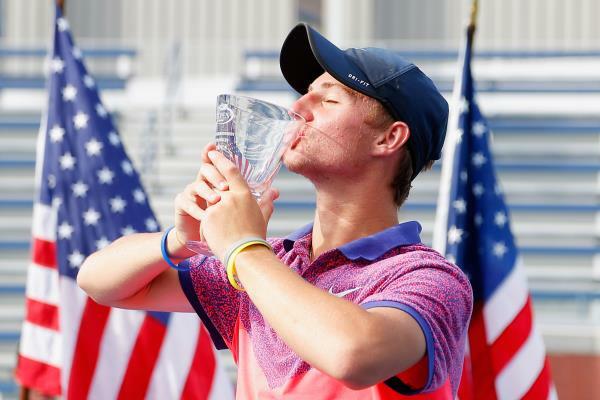 Raised in Endeavour Hills – where he honed his skills – Jasika, 18, has arrived in the big time after claiming a four-set thriller over hard-serving Ukranian Illya Marchenko. Not many gave the Australian Open wildcard entrant a chance to advance, but Jasika claimed his pass to the second round the hard way. Jasika powered through his Grand Slam debut 6-4, 3-6, 6-0, 6-4 as the crowd got behind its next champion-in-the-making. With the Omar Army – the self-styled fan club of Jasika – proudly roaring in the background for the 18-year-old, Jasika broke Marchenko late in the fourth set before serving out to take the win in two hours and 34 minutes. He’s been in phenomenal form in recent years as he claimed the 2014 US Open’s boys singles and doubles tournaments – winning both finals matches on back-to-back playing days. In that tournament, Jasika showed the first signs of greatness to come when he backed up his doubles victory with Japanese partner Naoki Nakagawa 6-3, 7-6 (6) over Brazillian pair Joao Menezes and Rafael Matos by claiming the coveting boys singles title, knocking over France’s Quentin Jalys 2-6, 7-5, 6-1. It puts his name up there as one of Australia’s rising star prospects alongside Nick Kyrgios and Thanasi Kokkinakis and with his win on Monday, it’s clear many more will remember his name from now on. “It’s always good I guess to have more up-and-coming Australians and it’s a pretty big honour,” Jasika said in 2014. Jasika’s rise through the ranks has him knocking on the door of the world top-200 and he now faces high-power Frenchman Jo-Wilfried Tsonga in the second round.